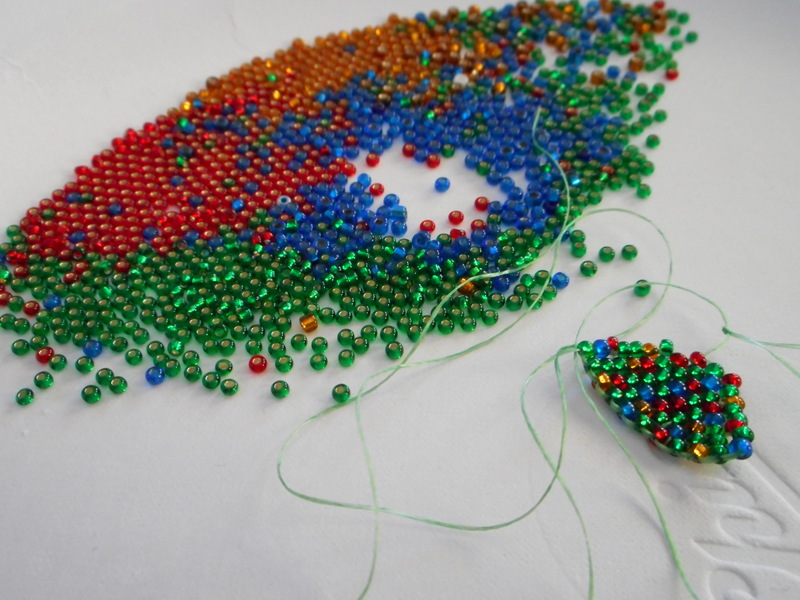 Beading this and that !! 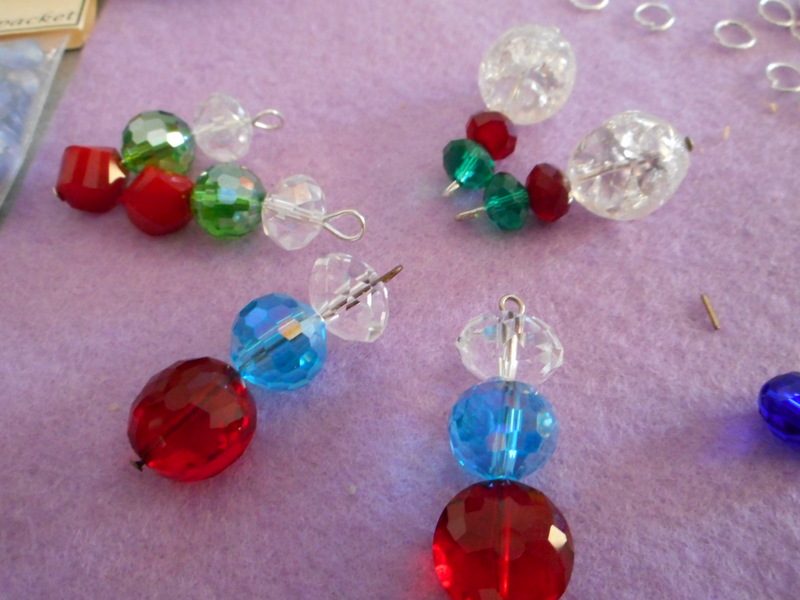 I have worked on the ornament hooks for a few days and then yesterday was not feeling very good but had promised our oldest grandaughter I would bead after school and so we sat and made up some earrings for ourselves and she made some for her mom and some to just make them !! I decided I did not have enough colors in my jewelry box, I have spent too much time over the years making to sell, so I was overdue making for me !! No reason to not have a pair for any outfit I might want to wear !!! So, here is what we came up with. I have not looped them, except for one and they did not come out good, due to not feeling good, so I figured until I feel like myself again, I will design and then loop them all at one in a day or two when I am feeling much more myself !! 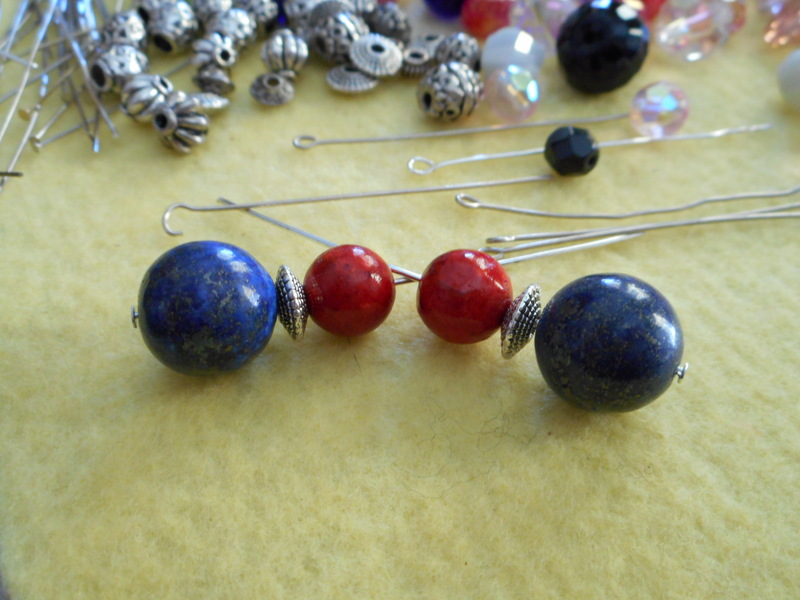 I love both these beads, the blue are 14 mm lapis lazuli and the red are sponge coral 10 mm beads. 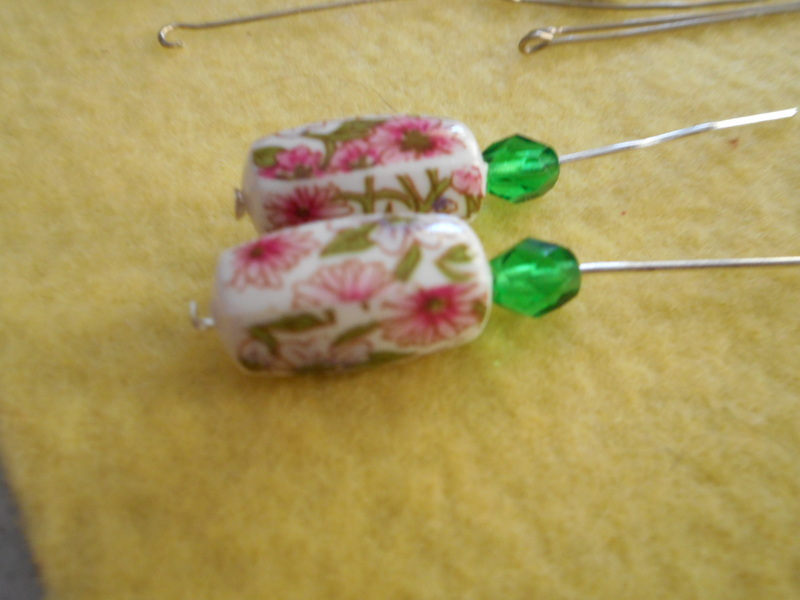 I had the pretty silver spacer beads from on old piece I took apart years ago. I am excited to wear this set !!! I just got these beads on sale from Fire Mountain Gems. They are another amazing store I shop at, and usually get a lot of stuff each time , as I buy when they have thier big sales !! 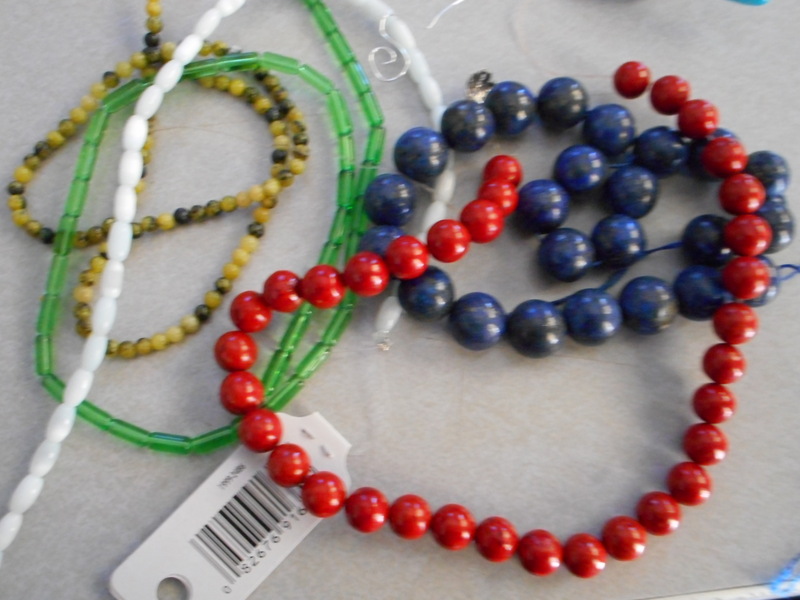 Not as good of quality as the items I got from Aunties beads, those are still among the best I have found, but they are not bad at all and great prices, so I pick carefully and have been pretty thrilled with my items each time. 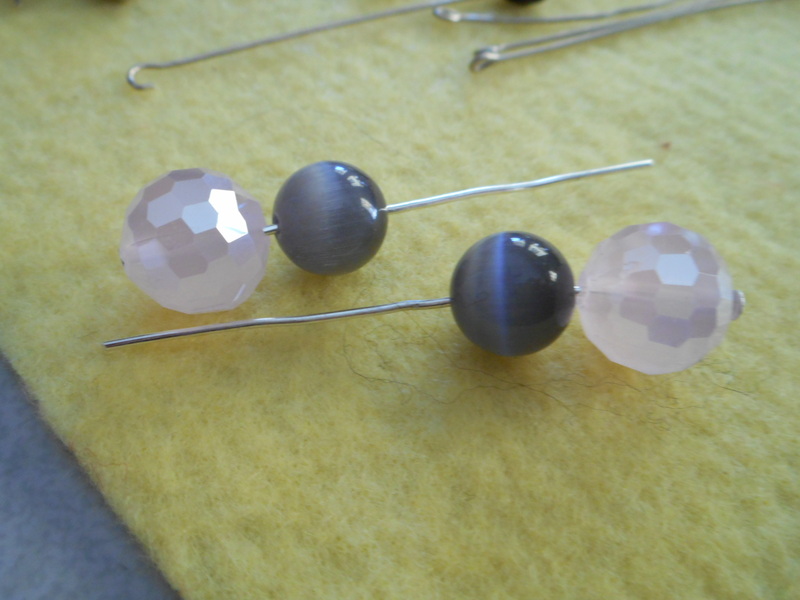 I love these soft gray glass cats eye beads combined with a soft pink faceted glass bead. So pretty !! another glass cat eye type bead, they are one of my favorite type of beads, but in a pretty green with black faceted glass beads ! !I need to put them on a shorter head pin, but I am still in the designing stage !! I am on the fence with this set. 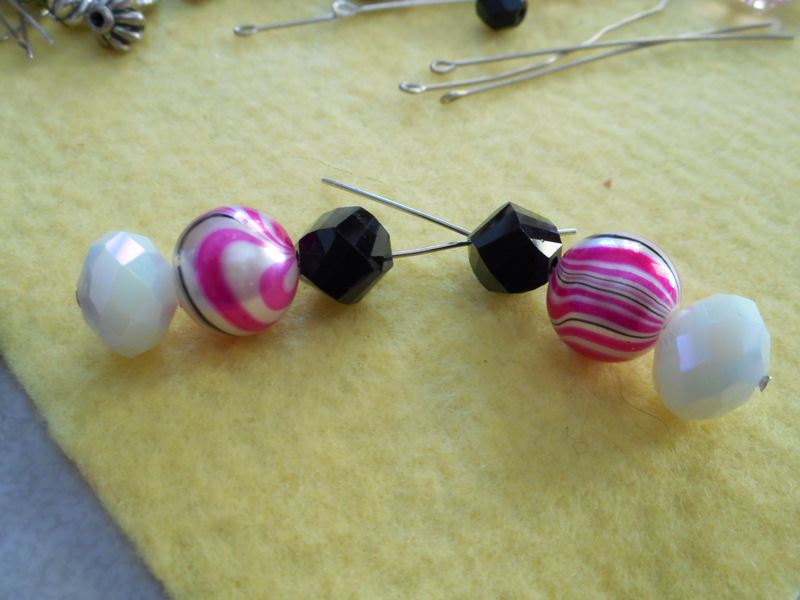 Really interesting glass beads with a swirl finish and no two the same, and I combined them with white glass faceted on the bottom and a black faceted glass twist on top. Just not sure if I like them yet , my grand daughter did !! I will decide thier fate in a few days !! On thing I take pride in is my looping skills, and this pair is horrible. I was not feeling good, and should not have even tried. They are not the same size loop and my wire wrapping was the worst I have done !! They are a total redo , should know better than to do that when I am not feeling good !! 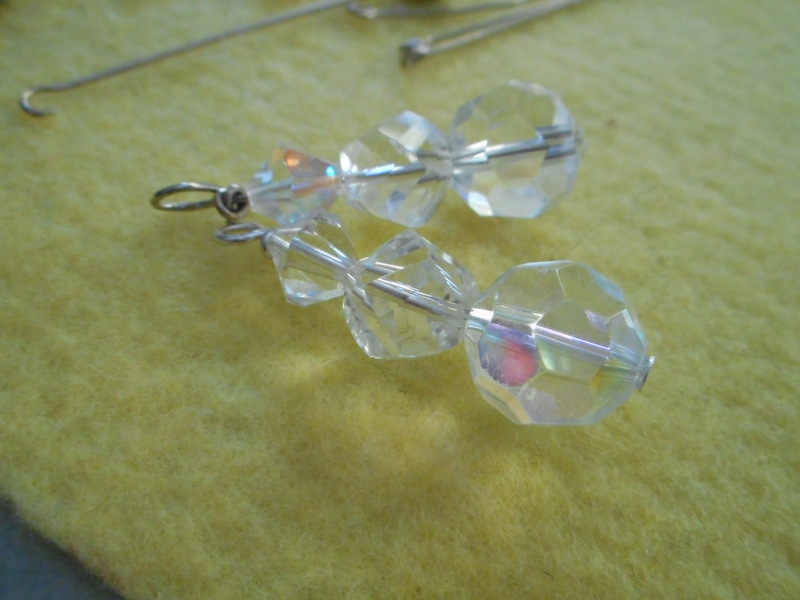 They are all glass faceted and the bottom beads have an AB shimmer to them, really pretty with large facets. 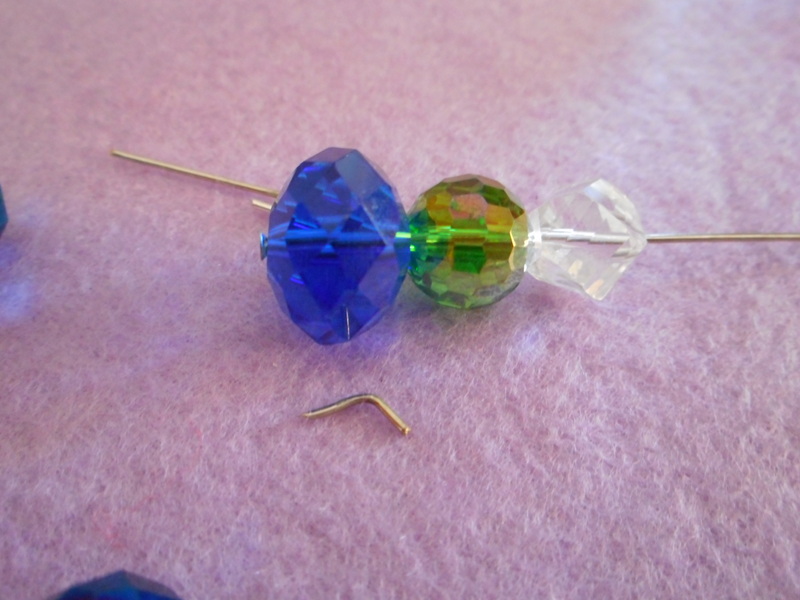 The middle bead is a glass faceted twist and the top is a simple bicone crystal. 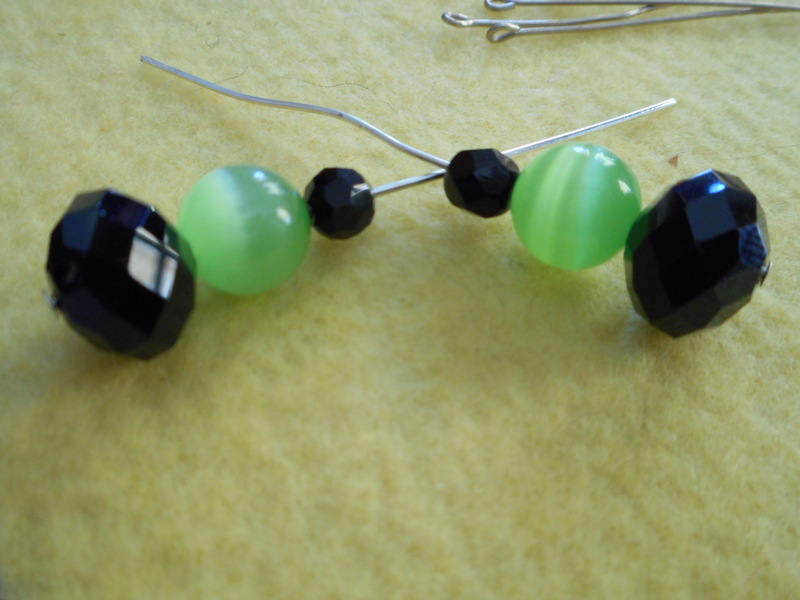 these are cute plastic vintage beads I combined with small fire polished emerald green glass beads. 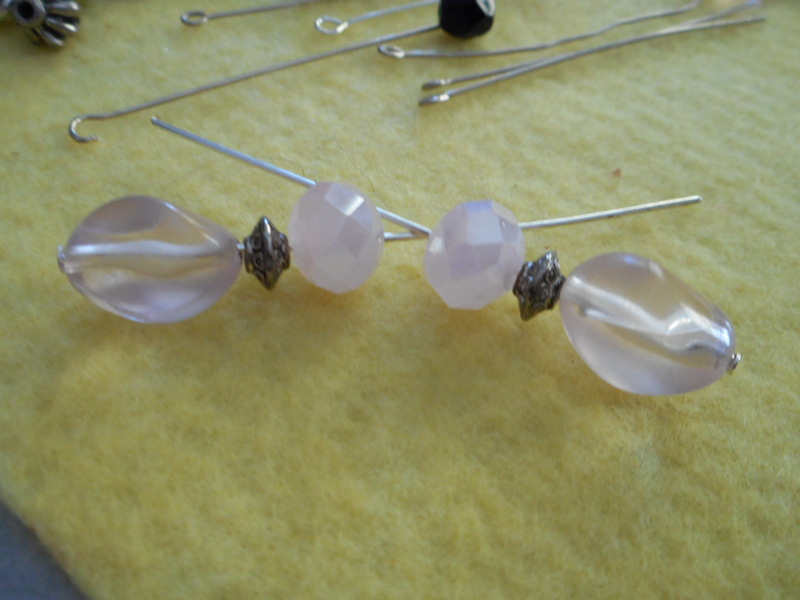 another soft pink with smaller versions of the pink faceted and some intersting pink free form beads from an old piece of jewelry taken apart and more pretty metal spacers from an old piece I took apart. I really love the beads in the next pair. 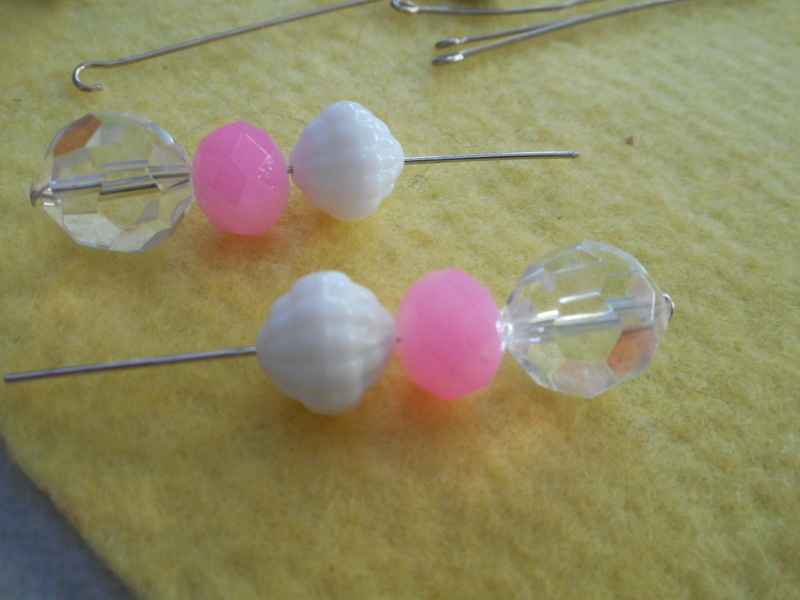 the pretty glass beads with the large facets and AB finish and a soft pink opaque glass bead and a vintage white bead with texture !! Love, love , love this pair !! Some sets for Christmas !!! A twisted faceted glass clear bead on the bottom, can you tell I love those twisted glass and have them in almost every color !! 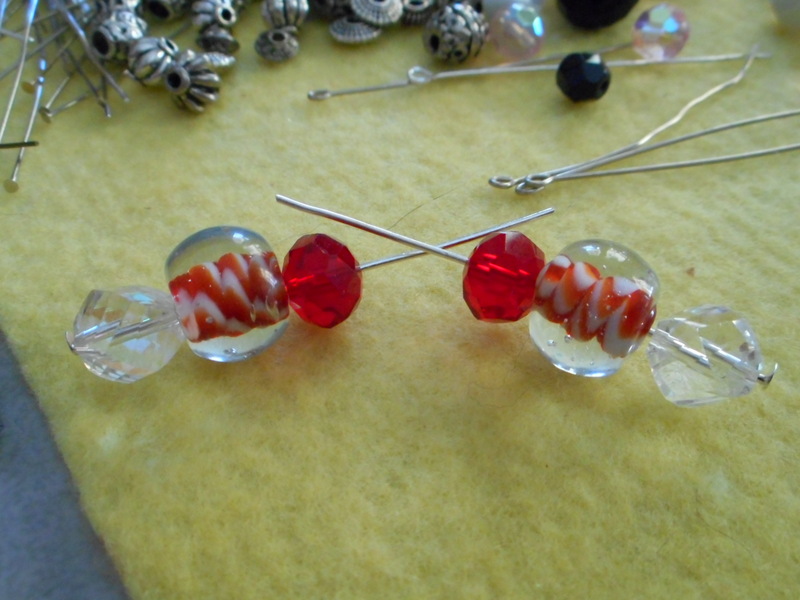 A red lampwork bead that looks like a candy cane with red and white swirled inside the clear glass bead, and then a simple red faceted glass bead on top. 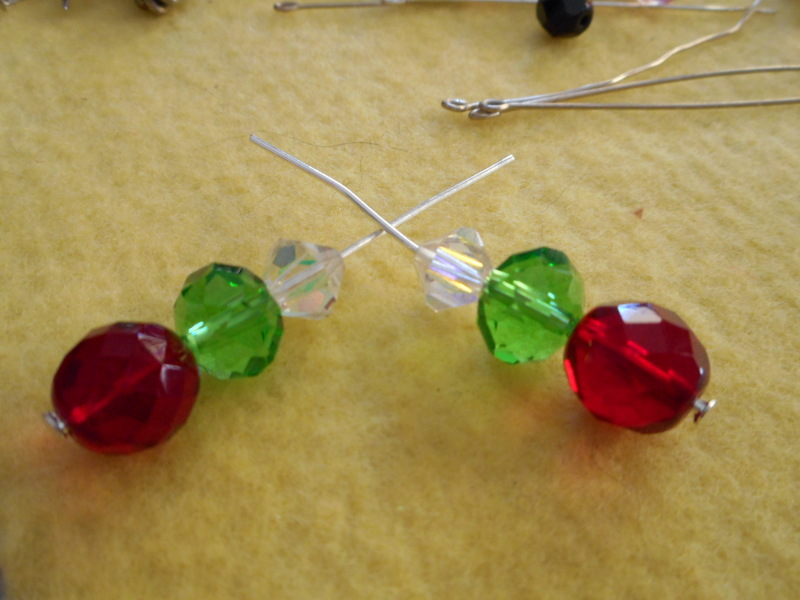 bicone clear crystal on top, faceted green glass center and a lovely oval red glass faceted bead at the bottom , very pretty beads !! Love them together !! Here is what our fourteen year old grandaughter came up with, she is so talented. 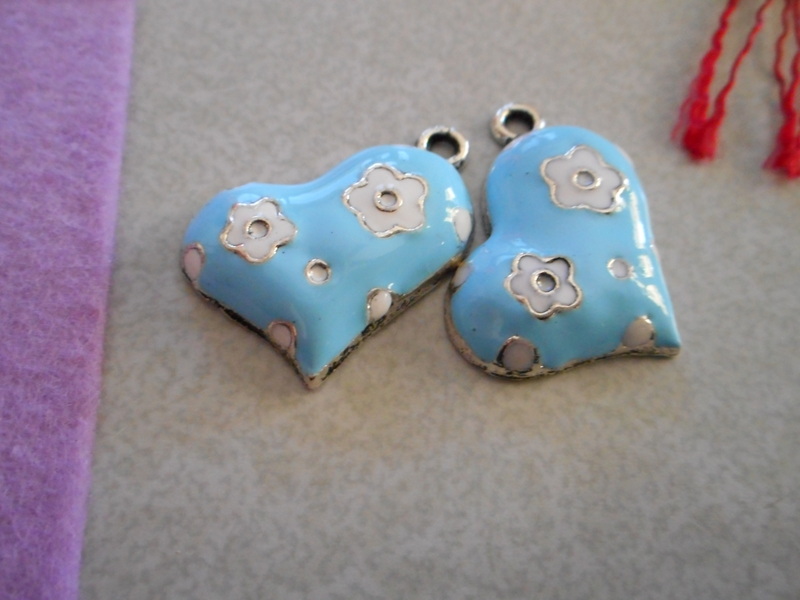 I forgot to get a picture of the set she made her mom, our daughter, they are really nice !! She has a good eye for color and we are going to work more next week too !! 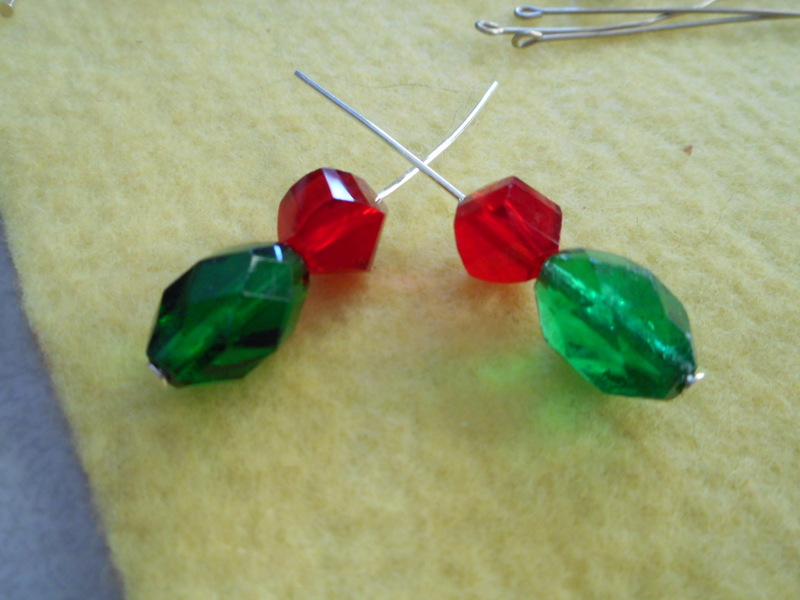 I was working on a pair of seed bead Christmas tree earrings, again, not a good idea on a day I do not feel good and I ended up with a knot I have to deal with, so I put it aside until I am feeling good. 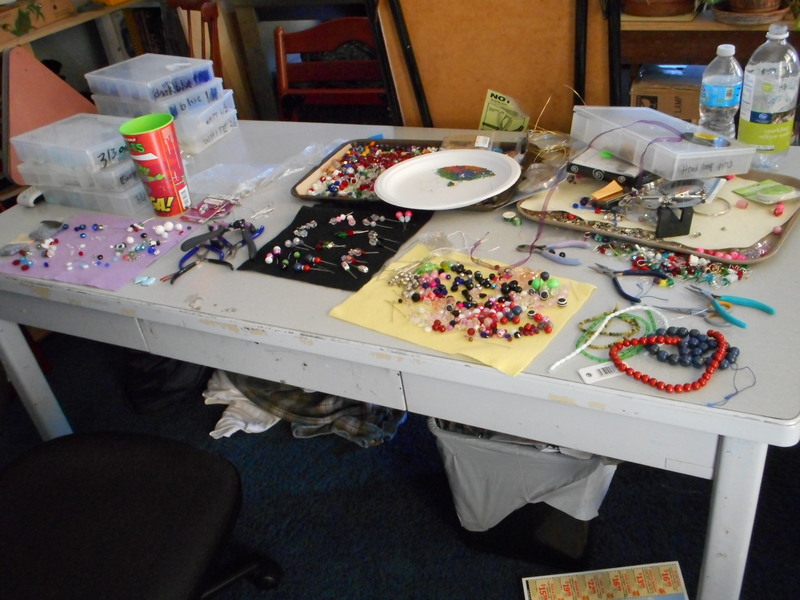 Here is our mess on the table, but a creative mess !!! Excuse the table leaned up on the back of the table, the studio is a mess as we go through and get stuff out to our storage barn. I hope to have it looking much better in the next week. 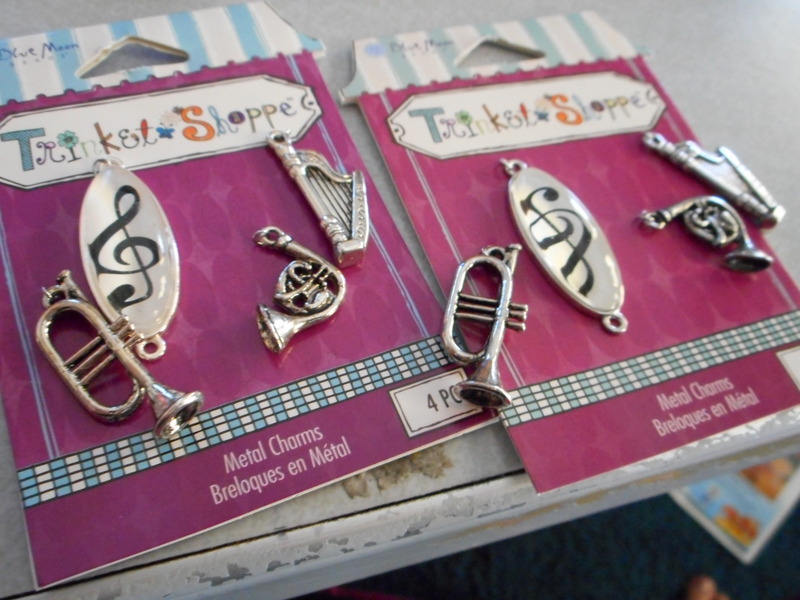 Our grandaughters picks, I let her order a couple of things , two sets at a buck each to make earrings out of , she is in band and she was thrilled with these and for two bucks, she can make four sets of earrings, not a bad deal !! I cannot wait to see what she does with them !! So, we are busy in the studio having fun !! I will finish up those earrings during the week, but plan to make a few more up in purple, brown, golden and tans, some orange and pink and a few more blue. I want a nice drawer of earrings for myself , along with the Christmas sets and the trees !! I have another project but I will do a seperate post on that one ! !